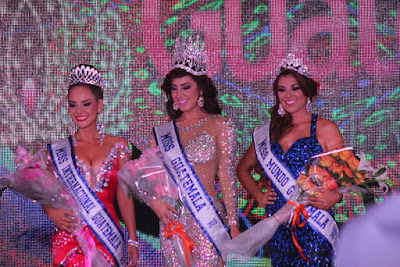 GUATEMALA CITY, Guatemala - Fabiola Jeimmy Tahíz Aburto was crowned Miss Guatemala 2015 at the Paseo Cayalá in Guatemala City on September 20. She will represent Guatemala in Miss Universe 2015. In second place was Maria José Larrañaga Retolaza. She was crowned Miss Mundo Guatemala 2015 and will represent Guatemala in Miss World 2015 in Sanya, China on December 19. In third place was Saida Nineth Jerónimo Valenzuela. She was crowned Miss Internacional Guatemala 2015 and will represent Guatemala in Miss International 2015 in Tokyo, Japan on November 5.